Did You Know That Hair Loss in Cats Can Be Caused by Medical or Behavioral Issues? Cat hair loss can be caused by medical or behavioral issues. There are different causes of hair loss in cats, some are quite normal, while others can indicate an illness that requires medical attention. Hair loss in cats is also known as "Alopecia," which means excessive loss of hair. Alopecia is not a disease, but a symptom. Cats normally shed, with more hair loss during warm spring and early summer months. Although, excessive amounts of cat hair loss is not normal and can indicate some type of underlying disease. Cats may experience flea bite hypersensitivity, which is caused by an intensive reaction to the saliva of the flea. They will go to any lengths to reach the agitated skin, including biting off hair in the bothersome areas. Common symptoms include extreme itching, redness, scaling, and hair loss. In some cases, the infected area can become infected, which will require more intensive treatment. Some cats are also allergic to pollens and allergens like dust, mold, smoke and tree pollen. This causes redness and itching around the ears and feet. The cat will excessively lick and bite the skin which eventually leads to hair loss. Initial treatment include reducing the exposure to the allergen, steroids, anti-histamines and special shampoos. Your vet may also prescribe medication to temporarily relieve the worst of the itching. In most cases, the fur will grow back. Hair loss due to poor nutrition often affects the whole cat, although it may affect areas that are easily worn and over the back and hips where hair follicles have shorter growth cycles and longer inactive periods. For a healthy hair, it is important that your cat food contain nutrients that support healthy hair and skin, such as: vitamins, minerals, antioxidants, Omega 3 and Omega 6 fatty acids. Remember, poor nutrition will make your cat's hair dull, loosen, and it will fall out. Another cause of cat hair loss is food allergy. Common food allergies are caused by grains (wheat, corn, soy), meats and fish (beef, lamb, pork, salmon), milk and yeast. In addition to hair loss, cats may also show other symptoms such as: reddened ears, excessive licking on the feet, itching and blistering and infection in certain areas. By feeding your cats with nutritious and balanced diet they will live a long and healthy life. Hyperthyroidism is the most common endocrine (hormone) disorder that cats experience, which will cause hair loss, weight loss, and skin lesions. This disorder is diagnosed with a blood thyroid level check, and it can be easily controlled with medication or radioactive iodine therapy. 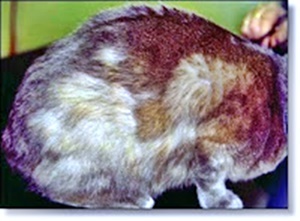 Ringworm can also cause cat hair loss. Cats can contract ringworm directly through contact with an infected animal, or indirectly through contact with contaminated bedding, dishes, toys and other materials. Your veterinarian can perform tests and determine if your cat has been infected by this fungi. In cats and dogs, common symptoms of ringworm in include skin lesions that typically appear on the head, ears and forelimbs. Ringworm can cause flaky bald patches that sometimes look red in the center. Psychogenic dermatitis, also called feline psychogenic alopecia, occurs when a cat licks himself excessively, due to anxiety, stress, fear, or boredom. The excessive liking can cause cat hair loss, skin irritation, and open sores. Be sure to identify and address the stress factor or factors that is causing your cat to experience psychogenic dermatitis. If your cat developed open sores, your veterinarian can prescribe oral or via injection medications that are designed to stop your cat from licking. In addition to medications, you can also use bandages or obstructing collars. Remember, to prevent this issue, be sure to identify and remediate any and all environmental factors that is causing stress to your cat. How is the cause of cat hair loss diagnosed? If you notice your cat losing its fur and you believe it is more than usual, it is best to take your cat to the vet to get a diagnosis for the loss of hair. Your veterinarian will perform a complete physical examination and pay take a closer look to the area. He will ask you questions, such as: if the cat has been scratching, itching, how long it has had symptoms, if it has recently had any medication (topical flea/worming products, injection etc). Fungus culture - To look for ringworm. Food elimination trial - Your veterinarian will place your cat on a food trial which usually lasts between 8-12 weeks. During this time, you must refrain from giving your cat any other foods, vitamins, minerals or chewable medications apart from the prescribed diet. Specific blood tests to check for hyperthyroidism. Specific blood tests to check for Cushing's disease. Skin scrapings - These are studied under a microscope to look for mites. Once a diagnosis is made, the vet will be able to prescribe the necessary medication to prevent further loss of hair. Please note, this is purely informational, the best source of advice and treatment regarding cat's hair loss, is your veterinarian.